The great thing about going to see a band perform live isn't always the songs they play, but the songs they don't play. Take tonight for example. 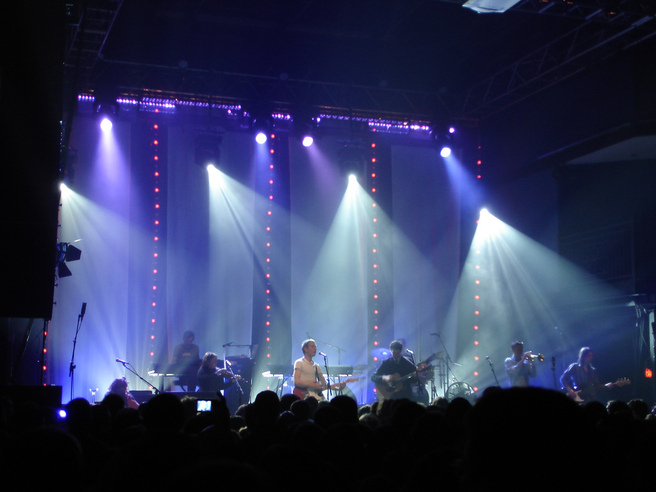 I just got back from seeing Belle and Sebastian for the fifth time in ten years. Like the other four times I've seen them, tonight's show was pretty damn amazing. Close to two hours of very sophisticated pop music performed by nine extremely talented musicians; all playing just about every instrument you can imagine. A lot of the music was from their new CD (which has grown on me daily), but a lot of it was also from earlier releases — crowd pleasers for sure, but essential as both band and audience understand. As you can imagine, I have my favorites too. And each time the band switched instruments and prepared to play the next song, I would make a mental note of what I'd heard and what I hoped to hear. Today's Happy Medium Song of the Day is one I didn't hear performed tonight, so that's why I'm going to share “Stars of Track and Field” with you now — from the album If You're Feeling Sinister.